Allows administrators to map, and unmap, products to all supported cart entities in bulk. Do you have a large number of products that need to be mapped or remapped or un-mapped? 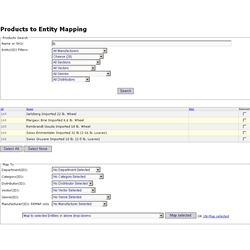 Do you want to save time by mapping multiple products to multiple entities at the same time? - Simple install, instructions included in download. We've had this must-have add-on since 2011. First in VB, this year in C#. I just had it upgraded for MS 9.3 and still works like a charm. Thanks Jan. Very useful and time saving all-in-one product to category / department / distributor / genre / vector / Store mapper! This is a terrific product! It virtually saved my website because we created 4500 products and did not map them to anything that would help us do a price update. Very easy to use and saves a ton of time over making individual mappings! Very simple to use. We have over 20k products that this allowed us to out arrange all of our products into different section. can not ask for anything better.